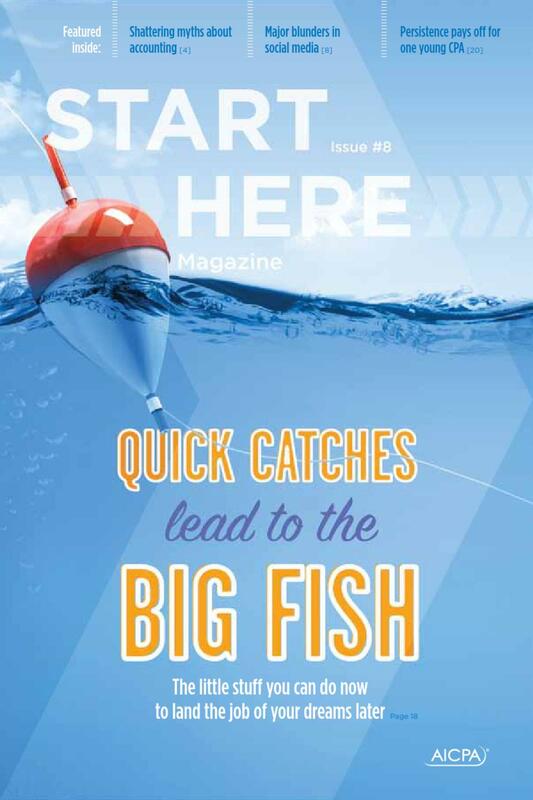 Start Here Magazine :: Start Here, Go Places. What you'll find in this issue - hot off the presses! BANKING ON EDUCATION - Students at Hillside High School are getting real-world experience staffing their own bank. 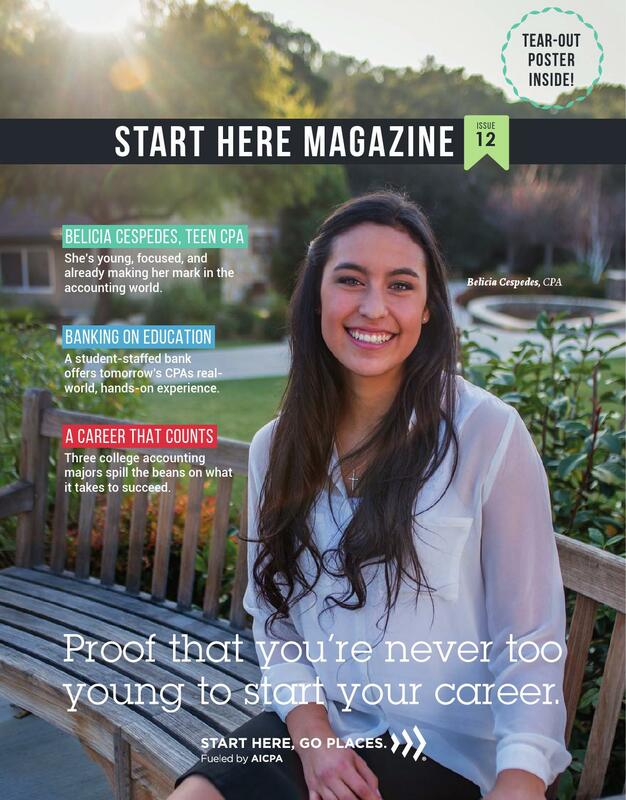 BELICIA CESPEDES, TEEN CPA - This teen CPA’s story will inspire you to get involved in the accounting game ASAP. A CAREER THAT COUNTS - Three bright students share what being an accounting major in college is really like. THE $125,000 QUESTION - HOW TO PAY FOR COLLEGE - Can you live the college dream without it becoming a financial nightmare? Yes. We can help. PUTTING THE PIECES TOGETHER - Meet the CPA behind Coca-Cola’s global finance operation and see what advice she has for you. LETTERS OF RECOMMENDATION - SPECIALIZATIONS THAT MAKE CPAS STAND OUT - Going beyond CPA makes you even more indispensable in the accounting arena. See how. CITY PROFILE: AUSTIN - See what makes this Texas treasure such a hot spot for music, Millennials, and more. TWIST MY WORDS - Think numbers are fun? How about words? Fill in the blanks and enter your answers into the story we’ve created online at StartHereGoPlaces.com/twistmywords. Don’t peek at the story first! MUCHO MOOLAH TO MANAGE - See what kind of numbers you could be playing with as a major athlete’s personal financial planner. CASH-CONSCIOUS CELEBS - Which famous folks are surprisingly sensible when it comes to spending? Get the scoop! TWO-SIDED TEAR-OUT POSTER - On the front, your potential career path. On the back, the perfect selfie backdrop. Grab a pair of sunglasses and strike a pose. For extra credit, post your pic at #FutureSoBrightSHGP. THE REAL DEAL - Crunching Numbers for Groupon Inc.
ANSWER ONE QUESTION. SEE WHAT HAPPENS. CITY PROFILE - Washington, D.C. There's An App for that - Check out these apps that help you make the most of your time. 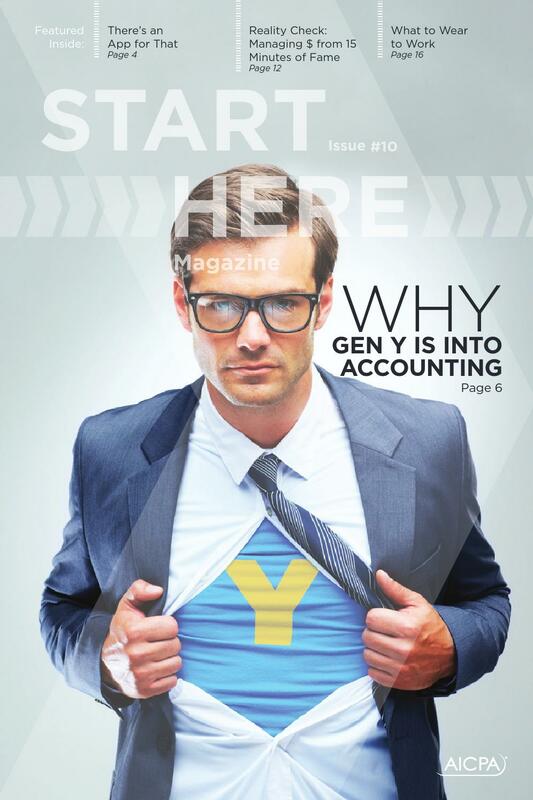 Why Gen Y is into Accounting - Top reasons why Millennials will make good accountants. Words from the Wise - Tips for finding a mentor, and why you should have one. Grab a No.2 Pencil - Eight things you need to know about the SATs and standardized tests. Reality Check - How to manage your money from your fifteen minutes of fame. Change your World View - The benefits of studying abroad. Sweet Success - A real world interview with a CPA at Hershey Entertainment & Resorts. What to Wear to Work - Always be dressed for success! City Profile: Chicago - Why you should consider making the Windy City your home. Being a Team Player - An interview with the accounting director for the Milwaukee Bucks. Life on the Road - Follow a forensic accountant around the world. Q&A With An Etsy Accounting Guru - Find out how this accountant gets creative! A World Without CPAs How scary would it be? Very. CPAs: Who We Really Are – and who we aren’t The movies rarely get it right. gleek by association How a real-life CPA found himself working with one of TV’s most popular shows. Quirky Jobs Even accounting can be eccentric. Pick Your Path Take a look at the accounting options that lie ahead. Today’s Moneymakers The people, products and places that are raking in the cash. What’s the Best Kept Secret About the CPA Profession? The answers may surprise you. The World is Your Piggy Bank Tips on finding all the college cash you can. No Sleep ‘Til Graduation Inside the jam-packed life of a college student. College Courses: What to Expect A sneak peek at the classes you might tackle if you major in accounting. Money Tips: Credit or Debit Get a handle on plastic now and make the right choices with your hard-earned dough. Yes & No - There’s more to these accounting questions than you might think. #Fail - How not to screw up on Facebook and other social networking sites. Community College - Don’t overlook the potentially awesome post-high-school option. Goooal! - How college student Angel Jimenez excels, whether in cleats or interview shoes. Sock It Away, Now - Financial tips to put you in great shape down the road. CPA MASH - A sort-of-magical approach to predicting your future. Quick Catches Lead to the Big Fish - Today’s little opportunities add up to greatness tomorrow. Persistence is Everything - How CPA Scott Geans overcame all kinds of stuff and followed a former president’s lead. Ask a CPA - Soak up valuable career insights from those who know best. CPAs: Opportunity Knocks. And Pays. - CPAs are in demand. And they command money—lots of it. From Good To Greater Good - Jessi Hargis had all her credentials. But it took a while to find her calling. King Of The Royalties - Who pays when your favorite song plays? Ask CPA Craig Zimberg. From Dorm Room To Billion-Dollar Business - A college student takes on the real world for a day. 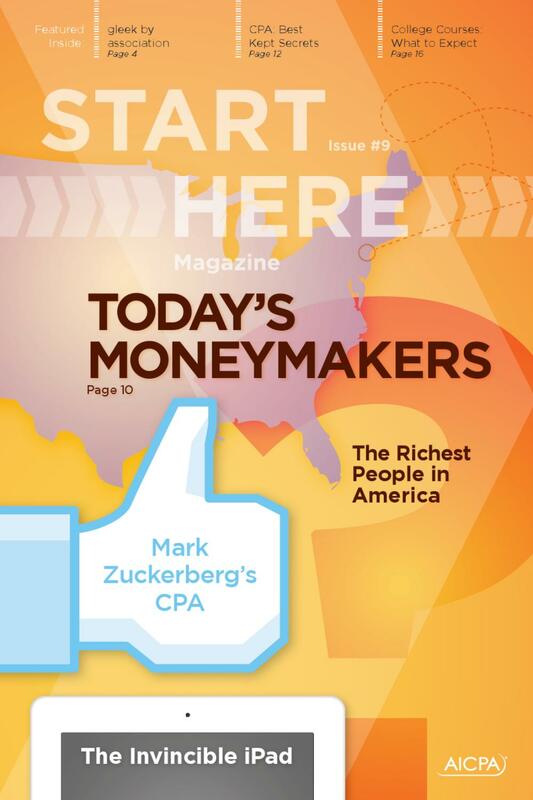 CPAs Share Their Two Cents - Advice and aha moments from CPAs. A Day In The Life Of A College Student - Jessica Nguyen chats about college, courses and a few life lessons too. A Day In The Life Of A CPA Candidate - Dan Wagner takes a study break in his quest for accounting’s big-league credential. Can’t Wait For College? Don’t. - Get prepped for college by getting a head start in high school. Choosing The Right College - Decide which school colors you’ll be wearing come fall. Free Money, Anyone? - Loads of scholarships and financial aid, all waiting for worthy applicants like you. Glad You Asked - Answers to those burning questions you have about accounting. The Most Necessary Job in the World - Every company, organization and overpaid celebrity needs a CPA. Here’s why. Kiss Minimum Wage Goodbye - CPAs have skills—and they’re paid handsomely for them. 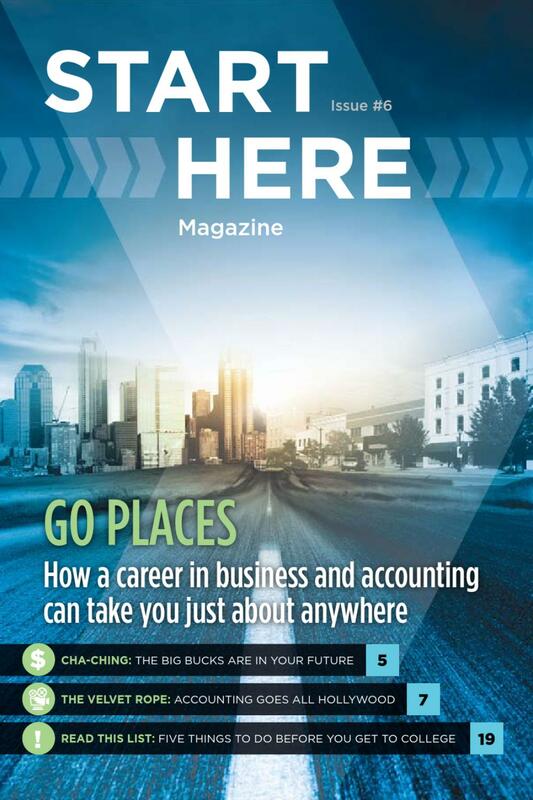 CPAs Wanted - The world is clamoring for accountants now more than ever. Accounting’s Red Carpet - CPA Andy Horn has the most glamorous accounting job around. Risky Business - Meet a CPA with an unusual job description: busting bad guys. CPA: The Possibilities - Just an itty-bitty sampling of the millions of places a CPA career can take you. 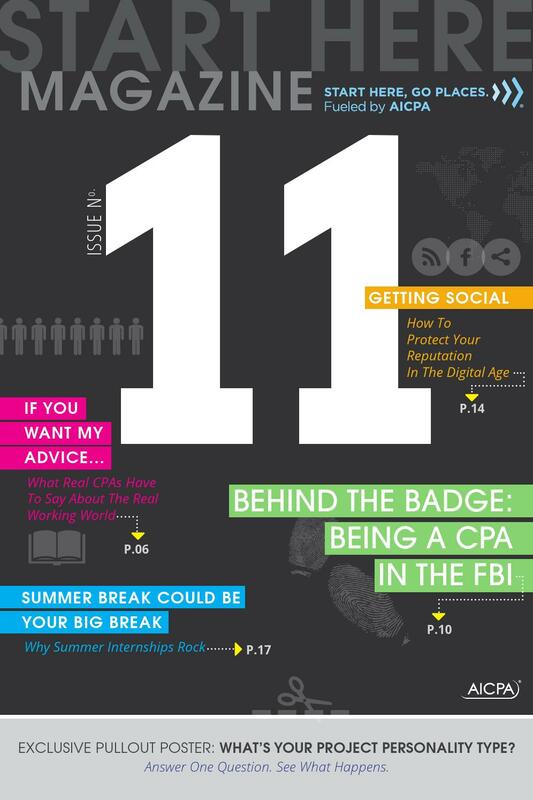 CPA Snapshots - CPAs are all kinds of people doing all kinds of interesting things. What’s Your Type? - Find out which accounting career is meant for you. College: A Quick Study - Where to go for a top-notch accounting education and what to expect while you’re there. From Point A to Point CPA - Follow these steps and you’ll be raking in the paycheck in no time. A Foot in the Door - Getting an internship can kickstart your career. Here’s how to make it happen. TAKING CARE OF THE BUSINESS - Every company, from Google to your local pizza joint, needs a CPA to keep it moving in the right direction. Here’s why. COUNTING IT UP - Accounting from a numbers perspective. BUT CAN I REALLY BE AN ACCOUNTANT? - The road to becoming a CPA is paved with good books, among other things. PICK A WINNER - How to find the right accounting program for you. IT’S YOUR CHOICE - Which type of accounting you’ll pursue is your own choice. 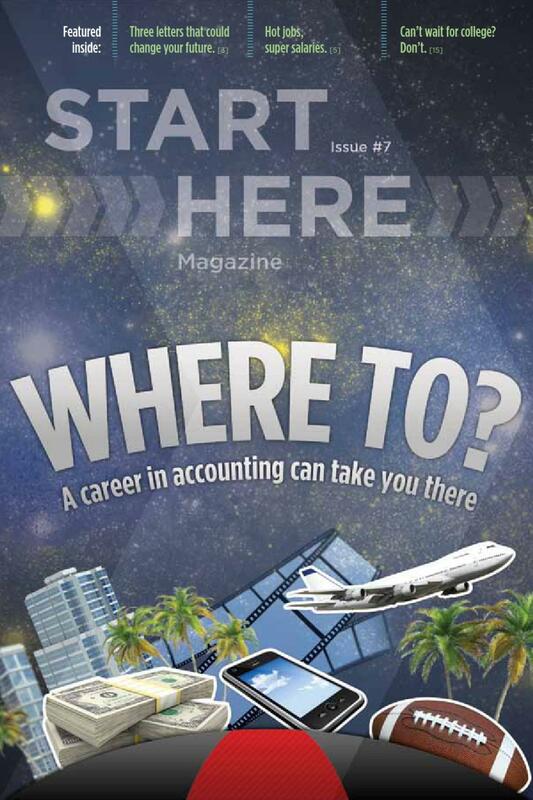 Check out Start Here’s primer on the different jobs available for CPAs. HOW TO GET AN INTERNSHIP - The best way to know if you’ll like a career is to try your hand at it. Get the down-and-dirty on how to snag that all-important opportunity by way of an internship. CLICK HERE. GO PLACES. - Your future is more than a game, but that doesn’t mean it can’t be fun. FROM THEORY TO PRACTICE - One recent grad shares his stories of working and studying in China. The Ledger - Spidey’s accountant speaks up; where tax meets basketball; environmentally aware accountants; and professors who impress. Gotcha! 101 - Meet an IRS criminal investigator who nabs the bad guys by day and teaches students how to do so by night. Splitting the Pie - The nitty-gritty on celebrity splits – the forensic divorce CPA’s findings. Puzzling Matters - As the Brand Turns…Advertisers can’t figure you out – herewith, their efforts to get the message out. Plus, test your wits on our brain-teaser. Go Figure - She’s Got Game - As a utility player, ballpark budgeting is just one role for Cleveland Indians’ controller, CPA Sarah Taylor. Ledgers, Payroll, Action! - Film producer Monica Levinson couldn’t have made the hit film Borat without sound accounting advice. Click Here Go Places - Your future is more than a game, but that doesn’t mean it can’t be fun. Personal Account - Fashionably Profitable Designer Phillip Lim relies on his fashion sense and his accounting background for success. Kickin' It i-Banking style - The world of finance relies on the expertise of CPAs, and here’s how to get in on the action. THE LEDGER - Feed the pig, iPods, and CPAs who work hard and play even harder. PERSONAL ACCOUNT - A True Bean Counter! Toss out your prior notions of a bean counter and meet Mary Jannisse, the woman who oversees the finances of Jelly Belly Candy, a company that sells 15 billion jelly beans each year. GO FIGURE - A Man Named Moneymaker - Poker isn’t all fun and games for everyone. In fact, for Chris Moneymaker, it’s a living – and a good one at that. SWINGING FOR THE GREEN - Golfers have the burden of knowing that each swing could be the difference between a credit and a debit. See how one wannabe pro manages his career by managing his money. OPPORTUNITY ROCKS - Imagine strumming your way to your dream job. That’s exactly how musician and accountant Emily Richards earned her way into the president’s seat at MP3tunes.com. THE BUCK STOPS HERE - Accountants hold the moral reins on government spending by investigating and accounting for every penny that passes through the coffers of federal officials. And boy, can those folks spend. PUZZLING MATTERS - Test your wits on this brainteaser and discover some fun facts about college football. KEEPING TABS - DJs make a comeback, CPAs arm soldiers with financial savvy, American Apparel’s American appeal, and how to gang up on the boss and still be right. PERSONAL ACCOUNT - HIGH ON THE HOG - Meet Donna Zarcone, the woman riding high as president of Harley-Davidson’s Financial Services division. GO FIGURE - NEW BALANCE - When financial figures baffle rock stars and athletes, they turn to the twenty something founders of Mindlab for sound advice. SCARED STRAIGHT - Students get extra credit for going to prison… to meet white-collar criminals who have a serious lesson to teach. MYSPACE.COM BLASTS OFF - Without financial whiz Josh Berman, the community website’s launch might have been grounded. Instead, it reaped more than a half billion bucks from a sale to Murdoch. WHAT’S HOT THIS (FISCAL) SEASON? - Accountants are more than just accessories in the fast-paced world of fashion and retail. Meet the CPAs who keep an eye on inventory and merchandising. CLICK HERE GO PLACES - Your future is more than a game, but that doesn’t mean it can't be fun. PUZZLING MATTERS - DRIVE TIME - Test your wits on this brain-teaser. FUTURE VALUE - WHO’S THE BOSS? I AM! - Read up on one college student’s entrepreneurial journey. KEEPING TABS - Tunes to go, e-mail hoaxes, how to prevent credit card fraud, and tips on creating a hand-held video game. PERSONAL ACCOUNT - As head of internal audit for one of Las Vegas’ biggest casinos, Patricia Bowen keeps tabs on $2 billion in gaming revenue. THE FBI FILES - CPA-trained agents lead the way to busting corporate fraud and terrorism. NEW CHAPTER - Accounting savvy fueled Barbara Kaufman’s business success. KEEPING SCORE - Financial execs help the NHL and NBA stay in the game. YOUR FUTURE - How do you get there from here? CALLING THE SHOTS - Producing a blockbuster film takes smarts, savvy, and a serious flair for numbers. A report from the set of Tom Cruise’s new flick.